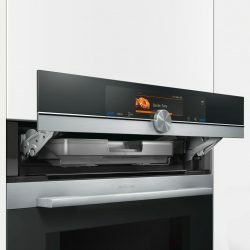 When it comes to compact ovens the CN878G4S6B really is the absolute best there is, with more features than you could ever possibly imagine. You who currently own or have ever owned Siemens appliances will know that they are top notch, and arguably among the very best in existence; they are certainly the best sellers in our showroom. Never prepare a dry meal again with the help of pulseSteam, the feature which uses hot moist air to cook rather than raw heat. Perfect for cooking cakes, pizza, meat dishes, and much more. The flexibility here is virtually endless. Home Connect allows you to use the power of Wi-Fi to manage your StudioLine range appliances, of which the CN878G4S6B is a proud member. Preheat your oven remotely, ready for when you get home. A simple idea but a very powerful one. Use your smartphone to monitor the progress of cooking, and never have to actually check in person. The beautiful activeClean feature will be popular for anyone who has ever had to clean an oven. It isn’t fun, is it? With this one that particular task is a thing of the past, using Siemens unique pyrolytic technology. The idea is that the cavity is heated to a whopping 480 degrees celsius, burning away all grease, dirt, and grime in seconds. All you ever need to do is wipe the sides down with a damp cloth. It couldn’t be easier. Finally, the CN878G4S6B is completely Shabbat compliant, allowing members of the observant Jewish community to remain in line with Halakha during the Sabbath.